Reviewer's Note: I did not play this game to completion. So there may be some inaccuracies. Nevertheless, this will help inform those who want information. Some people doubted that Square and Nintendo would ever cooperate again after their 'break-up' around the release of the Nintendo 64. But after a multi-year sabbatical, Squaresoft (now Square-Enix) games are back on Nintendo consoles. A dreaded force/energy/fog called Miasma has fallen over the lands. The Miasma kills any who come in contact with it. Not all is lost though, for there are crystals that emit a protective barrier. These crystals are kept in the center of the villages so they may survive. Unfortunately, the crystals need to be reenergized every year with the help of a substance called myrrh. Myrrh is very rare, and thus, villages send out small caravans of youth to retrieve it. This is where you come in. After creating your character you are sent on your quest. That is the basic back-story, as for in-game story, there isn't a lot of one, and what there is has little effect on gameplay. This almost seems to be a let down from a company renowned for its story telling. Gameplay, the factor that makes or breaks game. And FF:CC fares well here. Just how does the game flow? Something like this. From the world map select the area you wish to enter (village, dungeon, or Miasma stream), then continue to fulfill that area's purpose. In the villages you can wander around, get (usually) random information from villagers, visit shops to buy/sell items, or go to the blacksmith to forge new gear. The Miasma streams exist only to hinder you. To pass, your crystal chalice must have the same element as the Miasma stream you wish to get through. Finally, on to the levels (or dungeons if you prefer), the meat of the game; here your purpose is to: bash hoards of enemies, collect various items and artifacts, bash more enemies, defeat the boss, and finally, collect the tree's myrrh (which is your actual goal). Now that you know what you can do in FF:CC, here's how you'll do it. All battle runs off of your 'command list', what it is, is the series of items/spells/etc. you want to use in battle. At first your command list has only four slots, and two of them are permanently taken up by 'attack' and 'defend'. Over time, you can expand your command list, which will make things a lot nicer for you. Now, how the game system works. Due to the miasma, you must remain in the small sphere of influence put off by your crystal chalice. In single player, you have a Moogle to take care of this for you, in multiplayer though one of the players must carry it, thus meaning he/she can't fight, or must otherwise put down the chalice. The control layout was designed for the GBA, so things feel a little odd on the Gamecube controller. After setting up the command list, you?ll select the action you want to take with L or R, and then use it with A. Often you?ll have to charge up the action before it will work. It sounds really simplistic, and it pretty much is. Nevertheless, it is fun, which is always what is most important. However, I did find the menus and the need to constantly alter the command list a bit cumbersome for an action RPG. As for multiplayer, I didn't have a chance to try it out, but it's said to be every bit as good, and often better, then the single player, so, one can imagine it is worthwhile. However, to play it, everyone will need their own GBA and GBA/GCN Cable. This can become quite costly, and it's not an option, it's a requirement. Here is where FF:CC shines the brightest. Without doubt, SquareEnix has great talent in the graphics department. Everything in the external worlds have an astounding graphical quality and beauty; whereas the cave worlds are very dim, but the lighting effects are great. The characters are well animated. And everything moves smoothly. And of special note is the graphical effect shown in when walking through any of the 'Miasma Streams', very cool. I quite looked forward to the music of FF:CC due to the acclaim Square has achieved over the years for their music. Sadly though, the sound department came up short of my expectations. First, voice acting, voice acting isn't key to a game, and personally I'd rather have text then poorly done voices so I didn't mind. Nevertheless, there is a small amount of voice acting in the game, namely, during the intro to every level, some female voice will tell an odd story/poem concerning the level. The quality of it is alright, just bizarre. As for sound effects, they work, but there isn't much that will make you say, 'oh my, that's the greatest sound effect ever'. Then the music, I just wasn't stunned by it, especially after playing the Square classic Chrono Trigger. All in all, it's not too bad, just not what SquareEnix is capable of and known for. For one player, this game will take a good while to complete, and you can continue playing after you beat it. But if you get into the multiplayer, it may very well last a long time. I don't see much point in a rerun through the single player however. FF:CC's core essence is in its hack-and-slash gameplay. The violence isn't graphic, and you don't kill people. 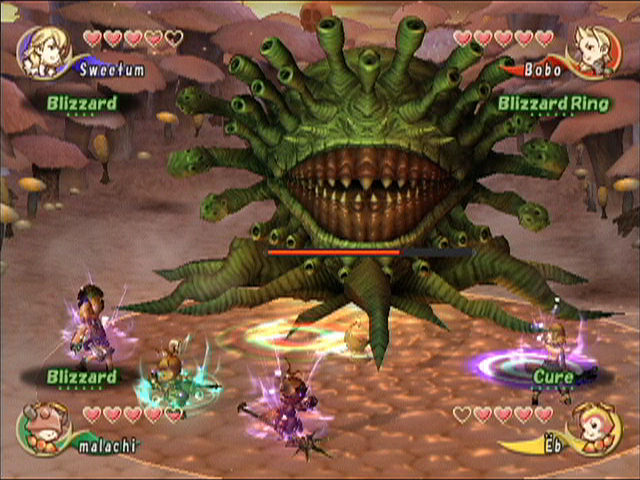 Nonetheless, you do dispose of countless hoards of monsters throughout the game. I don't believe that there is any profanity in this game. Which is almost surprising considering the language in previous FF games. The females of the Selkie race could use more clothing. And when selecting such a character (this is the only instance that this occurs to my knowledge) there is a distasteful animation effect. Other then these things I haven't found anything problematic in this area. This is where game falters most. As with all other FF games, magic runs rampant. However, it is not in a witchcraft/incantation format. In FF:CC magic is gained by acquiring 'magicite stones', which allow you to 'cast' the related 'spell' (there six basic spells, they are as follows: Fire, Blizzard, Thunder, Cure, Clear, and Life. There are also 'fused spells' which are used by combining two or more basic spells, these are as follows: Fira, Firaga, Blizara, Blizaga, Thundara, Thundaga, Gravity, Holy, Haste, Slow, Stop). There is also the support for the New Age powers of crystals (as it is the focal point of the plot). There are also the monsters you fight, creatures such as orcs, goblins, etc., and in some levels you'll also fight undead. Furthermore, every evil race has its magic users. On a positive note, unlike other FF games there are no summons, which I consider a very good thing. While the overall morality in FF:CC isn't pleasing, you probably won't even notice it. Which can be dangerous, but I don't feel that it warrants a 'do not play' warning. And the gameplay is quite nice, especially with the multiplayer feature. All in all, I give a 7/10 to SquareEnix' Gamecube debut.